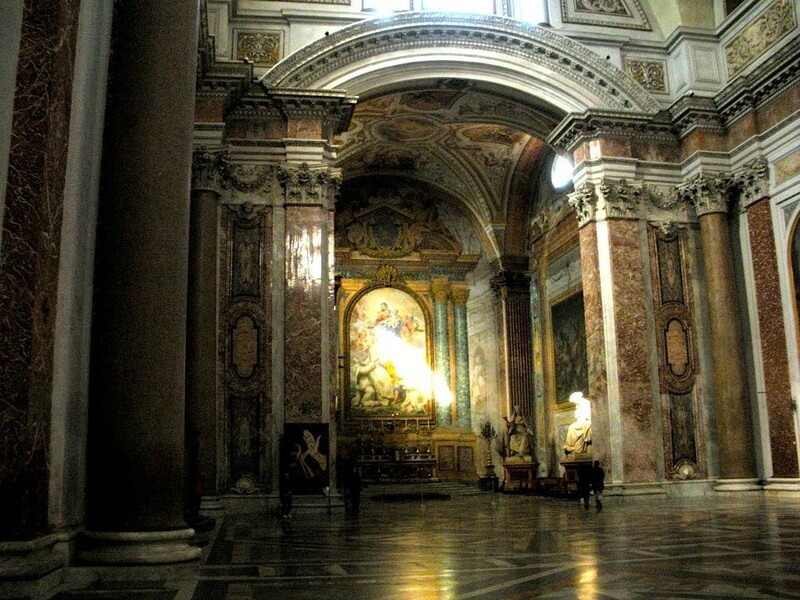 The interior of Santa Maria degli Angeli e dei Martiri. Photographs on this page were taken by the author, sockii. Although often only given minor note in most tourist guides and travel books, Santa Maria degli Angeli e dei Martiri (Basillica of St. Mary of the Angels and the Martyrs) is a unique church well worth visiting when in Rome, Italy. 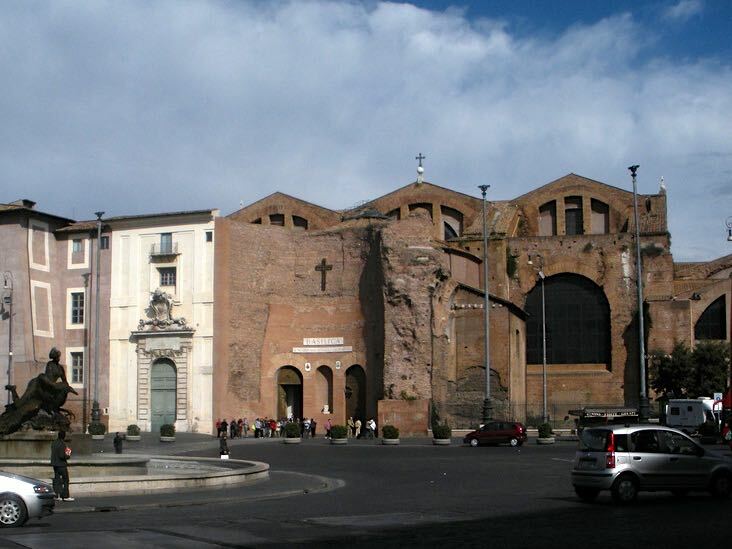 The basilica, originally designed by Michelangelo, was built on the ruins of an ancient Roman bath. With later modifications including a Meridian line and changing exhibitions, Santa Maria degli Angeli e dei Martiri offers visitors a fascinating portrait of ancient, Renaissance, and modern Rome. The unique exterior of Santa Maria degli Angeli e dei Martiri, built over the remains of an ancient Roman bath. A statue in Santa Maria degli Angeli e dei Martiri, where the monks took a vow of silence. The massive remains of the Baths of Diocletian had long dominated Quirinal Hill in Rome before a Sicilian priest, Fra Antonio Lo Duca, had a vision of angels in the ruins in 1541. Pope Pius IV, upon hearing of this vision, ordered that a church be built upon the site as surely this was a message from God. The church would be dedicated to the Virgin Mary, the angels, and to all the Christian slaves who had died in building the baths ages before. Michelangelo was commissioned to design the church, which he began work on in 1563 but only shortly before his death in 1564. 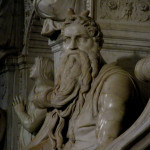 The nephew of Fra Antonio Lo Duca, one Jacopo Lo Duca, completed Michelangelo’s design. When finished, the church was given to the Carthusians, who constructed a monastery adjoining the church. The Carthusians were monks who had taken a vow of silence. 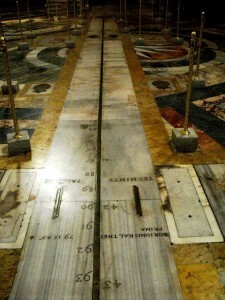 The meridian line in Santa Maria degli Angeli e dei Martiri. 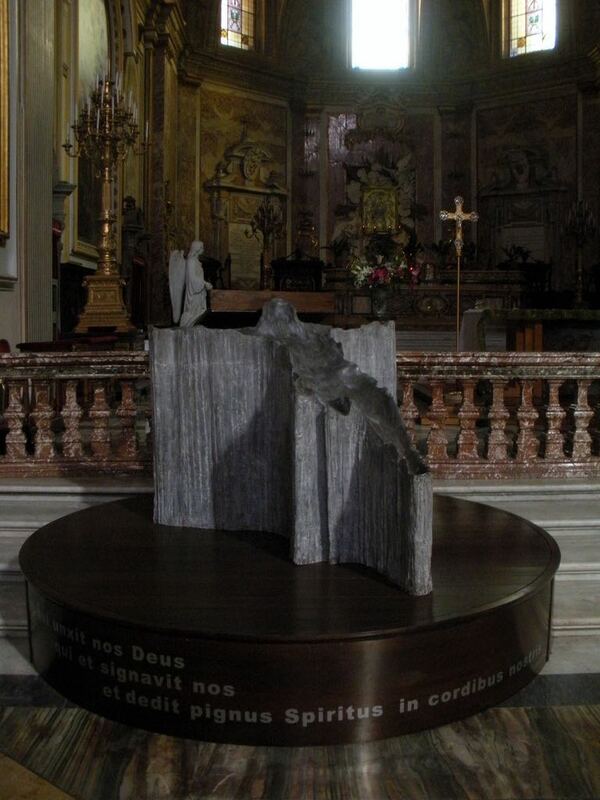 The addition of a Meridian Line to the church was commissioned in the early 18th century by Pope Clement XI. 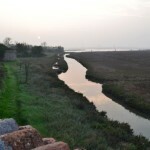 The church was considered an ideal location for the Meridian as, like other baths in Rome, the building was southerly oriented, high walled, and had long since settled into the ground, ensuring the Meridian’s accuracy well into the future. 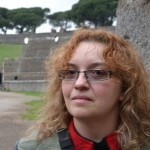 The location of the Meridian within the church would also serve symbolically to mark the victory of the Christian calendar over the pagan calendar of the past, which had been observed by the ancient Romans. Visit the church at 12:15pm (or 1:15 in the summertime) and see the sun cast its light directly on the Meridian line. Significant alterations to the church also took place in 1749 by Luigi Vanvitelli in order to prepare for the Holy Year of 1750. To some, these alterations changed the character of the church so much as to ruin the beauty of Michelangelo’s original design. Even so, its massive structure and interior artwork is still of significant note and worthy of seeing when in Rome. There is much to see at Santa Maria degli Angeli e dei Martiri, beginning with the ancient ruins of the bath’s frigidarium which serve as the church’s facade. Although incredibly old, the ruins give the church exterior an almost modern, abstract appearance. Once inside, one is immediately struck by the incredible scale of ancient Roman constructions. The church vestibule was originally a passageway between the calidarium (hot bath) and tepidarium (lukewarm bath) of the ancient structure. 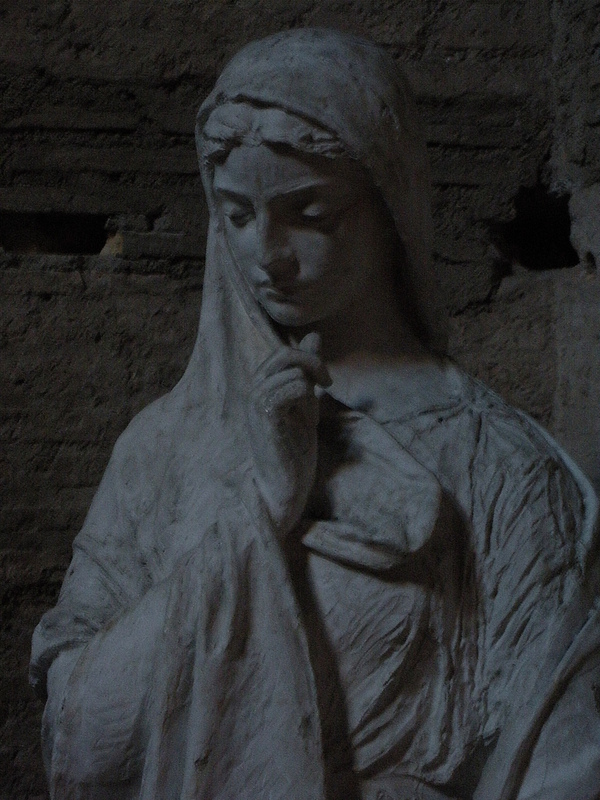 Artist Carlo Maratta is buried here, with a funerary monument of his own design. Modern art on display near the altar of the church. The chapel was constructed in 1575 and features an altarpiece by Giacomo della Rocca, who also painted frescoes along parts of the church walls. 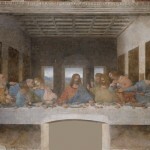 His original frescoes, however, cannot be fully appreciated due to poor restoration in the 19th century. 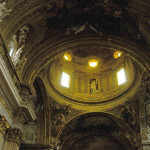 Sculptor Pietro Tenerani is also entombed in the left side of this chapel, while the Magdalene Chapel, which serves as the church’s baptistery, is the final resting place of artist Salvator Rosa. Beyond the vestibule one finds more artwork and monuments of note, including the last painting by Francesco Trevisani, “The Banishment from Earthly Paradise.” A statue of St. Bruno of Cologne by Jean Antoine Houdon was reportedly considered so lifelike by Pope Clement XIV that he believed it would have spoken if not forbidden to do so by the Carthusians. Also of note is the Chapel of the Relics, containing curious relics related to the martyrs of the baths as well as Saints Jerome, Augustine, Ambrose and Gregory. Santa Maria degli Angeli e dei Martiri is easy to find, located at the Piazza della Repubblica Roma (postal address Via Cernaia 9 – 00185 Roma). Information via telephone can be obtained from (0039) 06488 0812. Opening hours are Monday – Saturday 7:00am – 6:30pm and Sunday 7:00am – 7:30pm. The nearest Metro stop is Republica and it is served by bus routes H, 40, 60, 64, 70, and 170. After visiting the church, spend time at the nearby archeological museum, the Museo Nazionale delle Terme, which houses a wonderful collection of historical sculpture and artifacts.